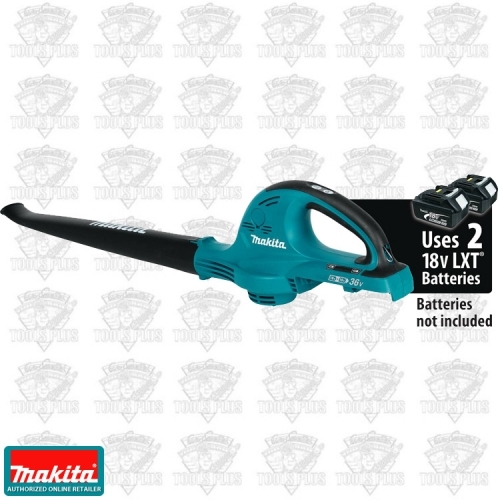 The 18V X2 LXT Lithium-Ion (36V) Cordless Blower (XBU01Z, the tool only) is powered by two 18V LXT batteries, so users get 36V power and run time for gas-powered demands, without leaving the 18V LXT platform (batteries and charger are sold separately). The XBU01Z has a variable 2-speed motor (0-10,000, 0-17,000 RPM) for optimum speed control and a maximum air velocity of 208 MPH with up to 30 minutes of continuous run time on a single charge. Added benefits include lower noise at only 60.6 dB(A) and zero emissions, making it ideal for applications in residential areas. The XBU01Z requires none of the maintenance associated with comparable gas-powered blowers: simply insert two charged 18V LXT Lithium-Ion batteries and the tool is ready for work.